Drug discovery is an exhaustive and time-consuming process involving numerous stages like target identification, validation, lead optimization, preclinical trials, clinical trials and finally postmarketing vigilance for drug safety. 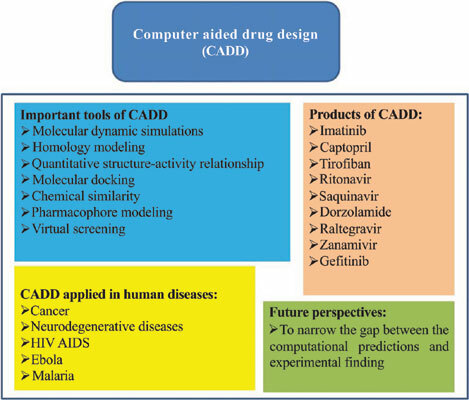 The application of computer-aided drug designing (CADD) is an indispensable approach for developing safe and effective drugs. Previous methods based on combinatorial chemistry (CC) and high throughput screening (HTS) consumed a lot of time as well as expenditure. CADD based approaches including pharmacophore modeling (PM), molecular docking (MD), inverse docking, chemical similarity (CS), quantitative structure-activity relationship (QSAR), virtual screening (VS) and molecular dynamics simulations have been quite productive in predicting the therapeutic outcome of candidate drugs/compounds besides saving precious time. CADD tools exploit structural and other information available regarding the target (enzyme/receptor) and the ligands to identify the compounds with the ability to treat diseases notably cancer, neurodegenerative disorders, malaria, Ebola, HIV-AIDS and many more. Computational approaches have led to the discovery of many drugs that have passed preclinical and clinical trials and become novel therapeutics in the treatment of a variety of diseases. Some notable examples of CADD derived novel drugs include dorzolamide, saquinavir, ritonavir, indinavir, captopril and tirofiban. CADD plays important role in predicting absorption, distribution, metabolism, excretion and toxicity (ADME/T) of candidate drugs. Overall, CADD represents an effective and much-needed strategy for designing therapeutically effective drugs to combat human diseases. ADME/T, Drug designing, Human diseases, Pharmacophore, Lead, Ligand, Target.